“Never let the competition define you. Before becoming a Vice-Principal then Principal, I had the honour and pleasure to teach for 12 years. I loved my work and was always guided but what I thought was best for students at the time. But, it’s true what they say about time and how it has a way of making you look at things from a different perspective. We are in an exciting time in Surrey Schools because much of what we have held to be true for so long is now open for discussion and improvement. Of particular interest to me are the changes to B.C.’s Curriculum and the discussion around how we can better communicate student learning to parents. I believe we need to question everything we currently do around how we inform parents about their child’s progress and how we invite parents to be partners in this process. During a recent community forum at our school, I prepared a presentation and in it, I used images of my own report card from my Grade 7 year. Doing so awakened many emotions that had been dormant for so many years – emotions and feelings of insecurity that I still work to deal with and overcome each day. My teacher’s comments and how they viewed me – a pleasant, average, boy – contributed to me viewing myself the same way. My parents considered me lazy and not as smart as my three older sisters, based on the letter grades I brought home. You see, those letter grades – those symbols meant to communicate my strengths as a learner – defined me. When you define a child in a certain way for long enough, they begin to define themselves in the same way. And so, because I was always compared to others based on grades and the notion that better grades meant you were smarter and worked harder, I began to doubt myself and my worth. I struggled with this for years, and realize that even today, some of this same thinking creeps into my consciousness. When I am asked to present to a group, be part of a team, or lead an initiative, I have to fight off feelings of self-doubt. I have to remind myself of my strengths and that with hard work, I can accomplish anything. This defining runs deep, even in those that love you. Etched in my memory is the day of my university convocation as I stood with my mom, waiting for a photo to be taken. She quietly turned to me and with wonderment, looked at me and said, “I never thought it would be you.” No cruel words, but simply the honest words of a parents who never received anything from school that would lead her to believe otherwise. How school defined me was all she knew. Having gone through this personally, you’d think I would have been more sensitive as a classroom teacher. Hopefully I was, but I now realize that each time I gave out a letter grade, I was essentially defining them, whether I liked it or not. I cringe when I think how many students I had a hand in defining in this negative way. Often, students who received these grades were the hardest working students in class, but found the work challenging. Some of these students were also immensely gifted in areas we didn’t measure with letter grades, or at all for that matter. To all my students…I’m sorry. And for that student who at the beginning of one year shared that her goal was to win the academic award, I apologize for not spending more time helping you focus on the joys of learning, creativity, and sharing your wonderful ideas with others. To all my students again…I’m sorry. This understanding drives me in the work I do today. I work with students each day who have a myriad of hidden strengths and abilities. I am committed to uncovering these treasures and encouraging others I work and learn with to do the same. I continue to work with my colleagues to explore new and innovative ways of inviting parents to this conversation about their child’s learning, to break down traditional barriers to authentic home-school communication, and to provide them a “window” into the classroom. Mostly, I am dedicated to ensuring that students have a say in how they define themselves and that I help them to do so in the most holistic, honest, and positive way possible. What will you do today to uncover the many hidden abilities your students possess? How will you share this information with parents? Maybe it’s because I recently wrote a post where I also said,”I”m sorry” to my students. Or maybe it’s because I try to read everything @gcouros recommends. In any case, great post. Finding the strengths of each student is something I’m finally beginning to understand. I work in higher ed, maybe even “higher” high ed since I teach grad students how to teach so they won’t be that prof who drained away your enthusiasm for studying cool stuff at university. I observed 2 dozen new instructors last summer and witnessed something I’ve never seen before. Back when I was a university student, I studied math, physics and astronomy. In those kinds of classes, *my* interests and experiences had no impact on the class. No matter what I felt or thought, the Sun is still 150 million km from Earth and F still equals ma. Some of my instructors would have given the same lecture even if no one was in the room. But this Summer, I watched an ethnic studies instructor. She had learning objectives for the class and a lesson plan but that plan said, essentially, “Get the students to share their experiences and then build the class around them.” Unlike my physics prof’s class, this instructor would had no lesson if the students weren’t there to contribute. So I couldn’t agree more with your plea to uncover each student’s treasure and then genuinely build those treasures into their learning. Our learning. Antonio, this is so powerful. I don’t even know where to start, but I just want to say thank you for saying what many of us feel. I, too, am so sorry to my past students for how I helped define them by grades given or comments at parent-teacher conferences or in everyday conversations when I didn’t know any better. I’m so glad you are there for these children today. You are making a huge difference in so many lives. I’ll never forget the passionate, student-centered principal I saw last June–all over campus relating, helping, encouraging, and making your students feel special and safe. Thanks again for sharing this beautiful reflection. You matter! Hi Antonio, thank you for the thoughtful post. It really made me reflect on how I’ve defined myself (through grades) and how this definition has in many ways limited me. Right now, I’m finally near ready to finish university and hoping to move into science education and teaching. “What will you do with this information?” I hope to keep this perspective in mind as I transition to the front of the classroom so that my students can have a say in how they define themselves – and so that, ten years from now, I won’t feel the need to write an apology post like you and Peter! Best wishes to you Jared as you complete your formal studies and enter one of the most rewarding fields. I feel a part of a revolution here in B.C. Canada where many Districts are finally asking the big question: How best do we communication student learning to both the learners themselves, and to parents. Let’s do it with information that is both descriptive, makes sense to all, and can be used by students as feedback to inform and improve learning. Thank you, Antonio, for sharing what many of us feel and managing to articulate it with such accuracy. For years, I felt the same way at the end of each term and I couldn’t pin point exactly why it bothered me, but I think you hit the nail on the head. I still remember bringing home the “B”s and dad (who was always proud), would still say, “How come it’s not an ‘A’?” Thank you for sharing your deeply personal, yet also professional story. Your dad sounds like mine 🙂 There was little recognition of what learning “did” take place, but rather a comparison on grades received. I know the intention was good and that he wanted me to do well, but in the long run it wasn’t helpful. We now have the duty to do a better job of this – with our own children and children at our school. What we didn’t get enough of – self awareness of our strengths and weaknesses, and descriptive feedback – we now have the opportunities to provide to our students! Thanks for reading and for your thoughtful comments! Thanks for sharing, Antonio! 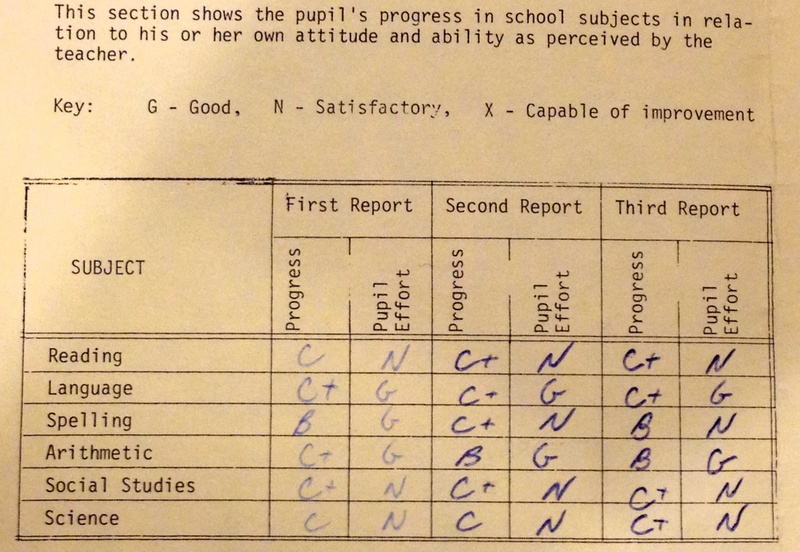 Just to share the “other side” of that coin … I was the “straight A” kid in elementary school. That set-up was just as devestating … going into secondary school was a shock when I wasn’t achieving the A’s but I thought that I was working just as hard and I didn’t think I had lost any brain cells :o) Struggled with my confidence throughout the adoloescent years and very lost in my early university life. I finally refound my confidence when I went into teaching. Through this personal struggle I found my “mission” about supporting / facilitating other learners as they set on their learning journey. Like you, I still find myself having self-doubts and at times lack the confidence about whether or not I will “meausre up”. Your sharing struck me in a genuine and authentic way. Thank you again for sharing your vulnerability and courage. Thank you Selina! I think that drawing on our experiences as learners makes a huge difference in the work we do with students in our schools. It helps ensure that learners today form their self-image on accurate and understandable information they can actually use as feedback. You were my seventh-grade teacher. And my older brother’s teacher before me. I appreciate your insight into the grades you assigned and how you think they defined your students. But I’d like to tell you, if you read it, that it was never what you taught us or the grades you gave us that defined YOU. It was that you took us out for so many sports during the school year. That you challenged us to think critically outside the curriculum. That you helped define us as people rather than just as students. I was so lucky to to have you teach me in grade 7. You were the best teacher I had. And thanks to your efforts to help us excel academically as well, I graduated from high school a year early. The fact that you put up this blog post relating your own experiences to those of your students is very touching. I say you have nothing to apologize for because even if you helped define us with those letter grades, you taught us so much that wasn’t in the books. Best wishes. Pass on my regards to your family. Reblogged this on Today is a Great Day for Learning.